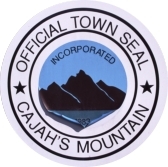 Cajah’s Mountain is one of Caldwell County’s most popular residential communities. The town is located in Caldwell County’s southwest corner and is kept linked by Connelly Springs Road, making it an ideal spot for residents comminuting to nearby commercial centers in Caldwell, Burke and Catawba counties. The town has seen recent expansion in residential growth along with commercial and industrial development. The town has also attracted new retail businesses and new professional services.